c) I turn one of those big numbers shortly after the event and really, really wanted to finish a half marathon before this milestone birthday. So what’s the problem? I’m starting to think I can’t do it. My various injuries to my left leg which have plagued me since Easter are all now sending messages to me, both while running and while moving around the house. Sometimes they even send me little messages while I’m sitting down, perfectly still. Every twinge, tightness and tingle seems to be another mental tick on the ‘will not complete’ list. As a result of my latest injury, a calf strain, I haven’t trained as much as I wanted to. The first 8 weeks of my training went brilliantly and I was on track (and improving) whereas the last 8 weeks have been sporadic, consisting of ‘gentle’ runs and of me being too scared to up the frequency for fear of aggravating my leg further. Now I am back to running a bit, I’m realising how much my fitness has suffered and I’m finding it hard to maintain the paces I was used to. As silly as it sounds, I feel like a fraud for being slow and undertrained and am worried someone might see me on the course and tell me I have no business attempting a half marathon. I did warn you – self doubt is insidious and leads to hugely irrational thoughts. I’m also starting to have panics about the heat and humidity in Hawaii. Perhaps something I should have thought about before planning a holiday around it but I was won over by the romantic notion of running alongside the beach, being presented with a lei with my medal and relaxing in tropical bliss afterwards. It’s only now I’m starting to seriously doubt whether I’ll make it to the finishing line. The rational part of my brain knows that these are all excuses. That I’ve completed things before which, at the time, seemed impossible and out of reach (the City2Sea being a good example). The time limit for the run is a generous one and I’m not out to beat any records, just to finish so, rationally, I know I can walk as much as I need to in order to finish. That the twinges I feel may be twinges but they may just be products of my overactive imagination. But self doubt doesn’t sit well with rationality and it feels a bit like a tug of war going on in my head. At the end of the day, it’s that that’s keeping me going – working through all the positives, goals achieved and training I have done, rather than focusing on the things I can’t change. I’m also making peace with the idea that, on the day, I don’t actually have to compete if I decide it isn’t right for me at the time. That not completing one event is a small blip and not the big deal my ‘self doubt’ head wants to make it out to be. But, if I don’t run, it will be because it’s not the right thing/time, not because I feel like I can’t do it. So, it’s over to you, blog readers. What do you do when self doubt creeps in and gets in the way of you achieving your goals? Any advice to help me put it all in perspective? What strategies and mantras do you use to push past it? When my alarm went off at 5am, I surprised myself by springing out of bed without much convincing. This was despite the rain and wind that had persisted all night and was still lingering today. 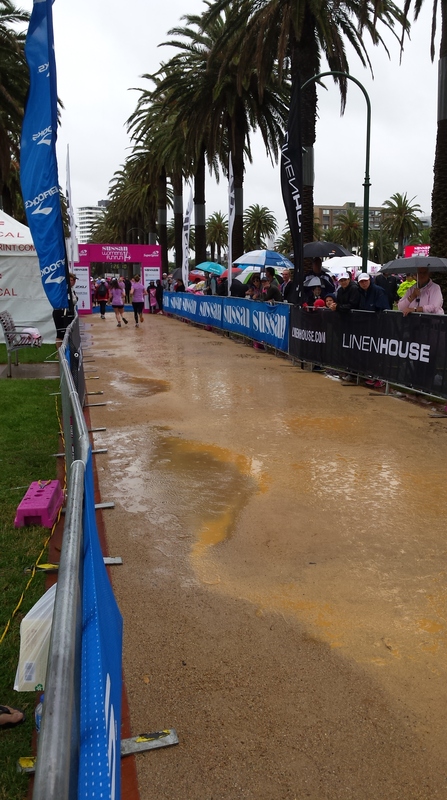 The Sussan Women’s Fun Run is probably my favourite event of the year and a bit of rain wasn’t going to stop me from enjoying it. The race is held along St Kilda foreshore and is a flat, straight course along the road with very little shade so I had been more concerned that it might be hot (not unusual considering it is supposed to be Summer!). The rain was welcome but I had to stop off and buy a poncho on my way to keep me dry until the event started. The reason I love this run so much is the atmosphere – so positive, friendly and non-competitive. Despite the weather, there was clearly the same buzz there this morning. I chatted to some fellow runners while we were lined up to start – so different to other big runs I’ve done where everyone is in their own headspace and the only communication is furtive looks when someone’s space is encroached. Definitely none of that here. Soon enough, the starting gun went and we were off. It was a crowded start and, with the wet road, I didn’t want to risk zipping in and out so I just cooled my pace and sat behind a couple of other runners at one side of the road. There was still some dodging as there were huge puddles left over from last night’s downpour. There is a good mix in this event of runners and walkers which is probably another reason it counts as one of my favourites – I don’t feel guilty or in the way for going too slow. The first few kms flew by and, before I knew it, I was halfway. 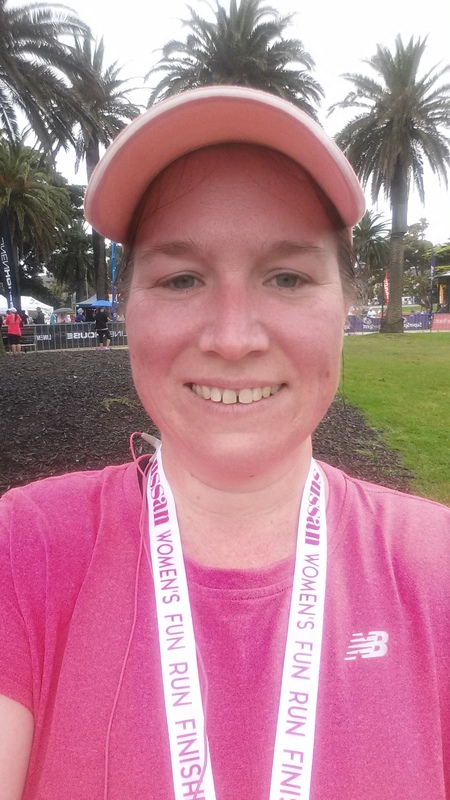 My first half time was about average for my 5km split so I knew I wasn’t in for a personal best but didn’t care – this one was really about enjoying the run and the crowd. It’s always funny once you settle in to a longer event, you find yourself running with/past/being passed by a similar group of runners. There were 3 or 4 runners who I saw at the 2km mark and who were still somewhere either just in front or just behind me at 7km. It was these unknown runners who helped when my feet had had enough – I shuffled along behind them and tried to keep to their pace so I didn’t have to think about setting my own. Because of the rain, my feet were absolutely soaked and were my most uncomfortable body part. It felt a bit like I was running in wet, concrete boots for the last km. Approaching the finish brought its own challenges – the run down to the finish chute was through Catani Gardens and along paths which didn’t cope well with so much water. However I was still smiling as I ran towards the finish line. I only missed a 10km personal best by 30 seconds so I wasn’t unhappy with my run. More importantly, I knocked 5 minutes off my time for the same event last year – great to see my progress over a year of running. I hung around for a short time afterwards to cheer a fellow five30runner over the finish line. It actually made me quite emotional to cheer on the women coming in – you could read on their faces both the elation at reaching the finish and the strain it had taken to get there. I wandered back to my car and changed into dry clothes for the drive home. Most entertaining was trying to get my compression socks on (a ritual for me after a long race). This is usually challenging enough with tired arms and limited energy but was even more of a contortionist act today with wet legs. Summary: A great event with a fabulous atmosphere. My 4th year of running this one – I’ll be back! 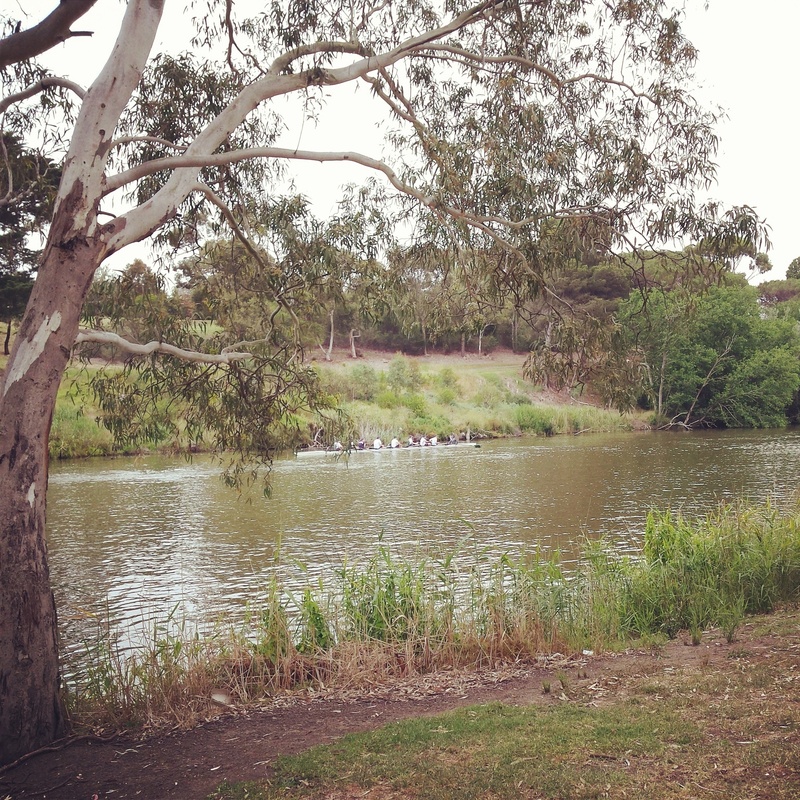 On the weekend, I ran in my local parkrun, which is something I often think about and plan to do but rarely actually seem to get around to doing. I’m not sure what stops me. Perhaps it’s the fact that it’s a smaller event and therefore has a greater chance of me coming last. Either way, this Saturday, I was there and thoroughly enjoyed every minute. The course that we run on is along the river and is absolutely beautiful. This week, it was further enhanced by rowers, cricketers, bike riders and picnickers enjoying the weather and stunning environment. I had a great run – comfortable and without any twinges from the various body parts that like to wake up and give me grief. The first 2.5km sped by but I felt the subtle hills after the turnaround point so walked up them and ran down. I ran the last km quite comfortably and felt strong at the end. Even better, I got both a course and a parkrun personal best (by 4 seconds!) which I was really pleased about. My training hasn’t been great this week – I’ve struggled to get back into the rhythm since my injury and camp but my running on Saturday made me feel like I’m doing ok anyway. 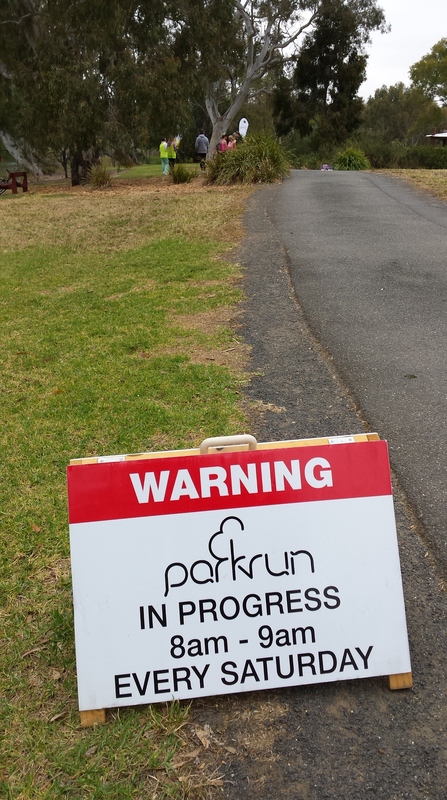 If you haven’t run a parkrun before, find one near you and do it. Such a great, low stress concept and a bunch of supportive fellow runners – a great way to spend a Saturday morning.